...and you can do it! We will be teaching a class this summer with TMCC thru the Community Education Program. Class will be a 4-week progressive basic class and will be a great way to introduce your friends to tango! We are hoping this will be a community-building project, so we encourage all of you to encourage people you know the sign up. Of course, all of you are welcome to join in! It's always nice to have some more experienced dancers in the class. Class will be on Wed evenings from June 19 through July 10 from 6-7:30p, at TMCC's Dandini campus. We think it will cost $69 for the 6-hour course; TMCC offers a 5% discount to folks over 65. Here's a link to the summer catalog - lots of other neat classes to take as well! Originating in the barrios of Buenos Aires and Montevideo, Argentine Tango is at it’s core a street dance improvising upon the logic of walking and gravity. Unique in partner dance, the couple lean into each other, connecting from the heart in constant sublime communication. • Balance and stability for the body. • Increased acuity for the mind. • Connection for the heart. • Art in motion for the soul. No dance experience required. We make it fun to learn. No partner needed for group classes. Got shoes? VZtango offers Thursday night classes in Argentine Tango Essentials (6:30 - 7:15 pm followed by 1/2 hour practica) for those just starting out or wishing to refine their fundamental technique. The class builds progressively through the month, reviewing and building upon what came before. Emphasis is on posture and technique for ease and grace in social dancing. Even if you have no dance experience, we make this exquisite dance fun and easy to learn. The steps, the lead and the follow are broken down to their essential techniques so learning is fast, accurate and progressive. Experienced dancers are recommended to attend the Essentials class to refine technique and encourage the new members of our growing Tango community. Cost is $10 for single class or $15 for both Essentials and Continuing classes. Continuing Argentine Tango (7:45 - 8:45 pm followed by 1/2 hour practica) for more experienced students also focuses on technique to improve balance, adaptability, precision and improvisation. Summer 2016 will feature a remix of steps and sequences designed to help you recall and seamlessly re-link and rethink on your feet. If that were not enough, we will also encourage you to dance heart to heart with both passion and compassion. Followed by a short practice session. 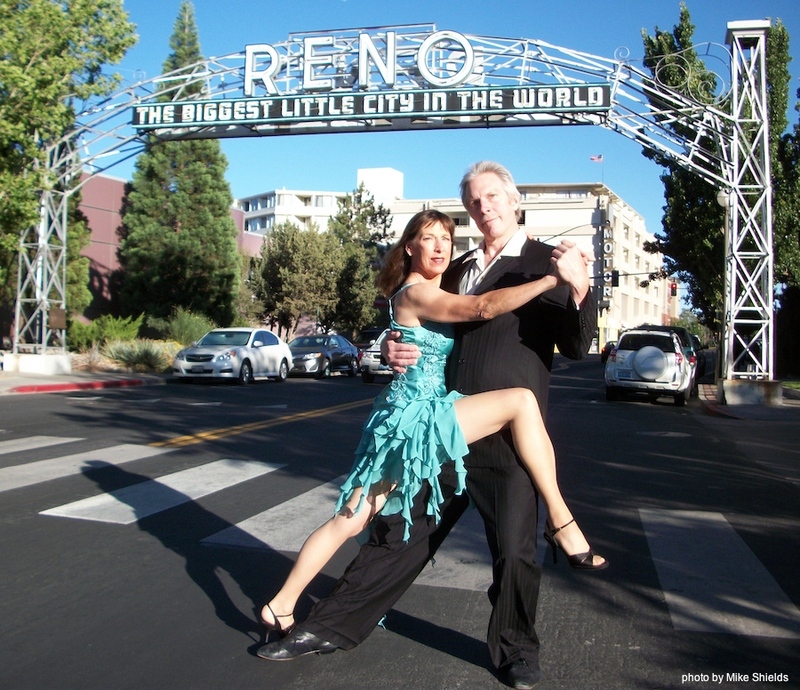 At the Ballroom of Reno, 2540 Sutro St., Reno, NV - see map below. Cost is $10 for single class or $15 for both. Practica is combined with classes on Thursday nights. We host a monthly Milonga - an Argentine Tango social dance event on the third Saturday of every month from 8 pm - 11 pm at the Ballroom of Reno, 2540 Sutro St., Reno, NV, cost: $10 at the door. Moths with a 5th Saturday we host an Alternative Milonga - see calendar for details! Two instructor intensive learning for leaders or followers. Emphasis on posture, technique and communication for social dancing or your special occasion. No partner required! Rates are $85/hr or $400 for package of 5, or $750 for package of 10 private lessons; rates include floor fee. Please inquire with VZTango Email for availability. ValenTango Performance Videos are live! Zak was an official videographer for ValenTango 2017, 2016 & 2015, and the performances are live on Youtube! Visit the ValenTango site here to see them. Below is one of my favorites: Paloma & Maxi. They remind us much of Oscar & Goergina! More videos HERE. Victoria and Zak Performing in Atlantis! Check out these videos we made at Burning Tango!